The best combo modem router for cable internet? Check out this Netgear C7000 review. The Nighthawk AC1900 is an advanced router when compared to the ARRIS. But we’ll compare it to the Arris SBG7580AC modem router. Why these two? Well, it’s simple. The Netgear Nighthawk C7000 router and the ARRIS Surfboard SBG7580AC modem are most popular combo modems available and you need one of these devices if you are on a cable internet provider which is why we put this comparison containing the two industry titans together for you. 24 download channels. USB Ports. Compromised Puma 6 Chip. No USB Ports. What is the difference in these two combo modem routers? The main difference would be the chip inside the modem. Unfortunately, the ARRIS has the flawed Puma 6 Chip which leaves users vulnerable to DoS attacks and has random latency spikes. While they have updated the firmware and claim it is better now, your going to have a safer bet with Netgear who uses the trustworthy Broadcom Chip. Other than that, they are both approved for all cable internet providers. Yes, compatible with any cable ISP. However, the Netgear is 24 download channels while the Arris has 32 channels. The thing is, they both exceed expectations and minimum requirements for the top tier speed packages available so this does not really matter. In this case, their number of bonded download channels is not a deciding factor for any current situation you may encounter. Unless you want Gigabit speeds, then you need to get a standalone DOCSIS 3.1 modem and a strong enough router. The Netgear Nighthawk C7000 modem router has a stronger wifi rating at AC1900, while the Arris SURFboard SBG7580AC gateway cable modem is rated at AC1750. This is not a huge difference, so do not let it change your decision. Performance wise, one could say they are almost the same with the Arris SURFboard and the Netgear Nighthawk having the same download capabilities but the Netgear having a slightly better wireless rating, making Netgear the winner here. Is that enough though? No, it’s not. The main difference that stands out to us is the Netgear has the well known Netgear Nighthawk interface and firmware that has been preferred by most tech support gurus for decades. Meanwhile, the ARRIS SURFboard has the lesser known, the lesser used and lesser preferred interface and firmware built on top of the flawed Pump 6 chip. I myself used it a bit because my ex-girlfriend went against my recommendation and bought it to save money. I did not like the interface. It felt dumbed down yet complicated and non-intuitive, even for me. She only bought it because it was cheaper and she did end up having to replace the ARRIS because her house was too large for the AC1750 wireless router. The biggest difference though? The Arris combo modem does not have a USB port. Yes, you may see one on it, but it does not have functionality. It is likely for a service port if you have to return it and they need to upgrade the firmware or something. The Netgear C7000 combo does have a USB 2.0 port. Why does this even matter? The USB port allows you to plug in an external hard drive and create a network attached storage so that you may back up your files from any computer in the house and even put your downloaded movies onto it for your smart devices to access them and stream. It’s really ideal for anyone not living in a cave. And of course, this means you can hook your printer up to the router and put it in whatever room your modem and router is in. This saves you space at your office desk. For most people the combo modem will be the best option. A combo modem is both the modem and router in one piece of equipment. Because the devices are consolidated, you have a lot fewer wires and complication to deal with. It is wireless AC1900 so it is great for a 2-3 bedroom apartment to normal 2 story house. Cons: The reasons I would not go with this combo modem router is because I prefer two devices. Sure the router modem all in one is a single device with fewer wires to manage, but I prefer two separate devices so if one fails, you only have to replace one. Bottom line? Great coverage, still good for non-power users who just want the easiest option for a normal sized living situation. This makes it the best combo modem for cable subscribers with services from ISP’s such as Time Warner, COX, Spectrum, TWC, etc. Do I need a combo modem or router? Yes, you will need a router or a combo modem to get a wireless signal. Here are the differences. Modem: The stand-alone piece of equipment known as a modem is the required device that picks up the cable internet signal coming into your home where the coax cable is. If you have only one computer and do not need wireless internet, you can hook straight into the modem without a router. Router: The device that hooks up to the modem and cast a wireless signal and allows more than one computer/device to connect. It also has a built-in firewall to protect your network from intrusions. Combo Modem / Router Gateway: Both of those in one piece of equipment to save space and simplify things. This really is the best cable modem option for most people in the market and why we recommend it to you. 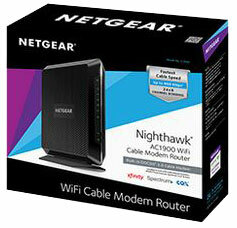 If you want the best combo cable modem router, then Netgear C7000 Nighthawk AC1900 reigns supreme. Not by performance rating, as it is almost identical to the ARRIS SURFboard SBG7580AC. It holds the title based on the built-in chip/firmware/software and the functional USB Ports. The ARRIS should be avoided in this situation. Thanks for the review. I am switching from Frontier FIOS to comcast and need a modem router. Everything I read seems to suggest the Netgear C7000. My only concern is that we don’t do a lot of streaming/gaming. I do want one that will be future proof for a while. Is the Netgear just too much device for me. Does the larger specs result in a better experience even for lesser users. If you think I should still go with the Netgear, is the C7000 better than the C6900 at Costco. Only saves about $5 over the C7000. Thanks! Gamer or not, the C7000 is a solid router that will provide a great signal throughout the house. As for the C6900, I’m not sure why they even made it. The only difference is it has no USB port as far as I can tell. And while you may think you do not need or want a USB port, you really should get it. You can hook a printer to it or an external hard drive and create backups of all of your important files to your network. This is huge. Especially if you have photos or other work. Never leave it all on your computer. Yes, this is true. The Puma 6 Chip is vulnerable to DoS attacks but the chance of that happening to a home user are almost null. I actually thought they updated the firmware and they say they did but I found some information regarding there still being random latency issues and will update reflecting that. The Netgear is capable of handling a printer. Q: Why is my Netgear Nighthawk C7000 dropping laptop internet connectivity all too frequently as in numerous times per hour? Driving me crazy. Recently moved and have Cox Communications versus formerly with Verizon (then it became Frontier). Am guessing this is a Cox Communications issue and not a Netgear modem/router issue. That’s a tough one. New router or same router you brought from your old location? Are other devices dropping at all? It could just be the laptop. Try updating the drivers? The C7000 shouldn’t have issues. It could be the laptop, Cox, your new house setup, or any number of things.